the general consensus amongst musician friends of mine is that one's listening pleasure ought best to be genres other than that which you play for preference. in my own case, that's hardly an onerous necessity (if indeed it is such), for the majority of musical situations in which i find myself these days revolve around much louder stuff than i would ever entertain on the dansette or ipod. and i think it might be a case of 'once-a-session-drummer-always-a session-drummer' as i tend to be rather wide ranging in my musical tastes as long as it doesn't involve head-banging or pogo-ing. the rationale behind this philosophy of listening to that which you don't play is what such a practice might bring to the table. though in an ideal world, i'd be sat behind a pianist and double-bass player, emulating the bill evans trio, the fact that i have the buddy rich big band, eric clapton, joe henry, madeleine peyroux and robert plant on my ipod potentially means that my musical abilities are not restricted to the confines of the not so average piano trio. 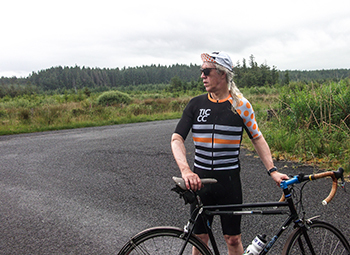 that particular notion might also be said to impose itself upon the increasingly congested world of cycling apparel, in this case, with particular reference to the jersey. it would perhaps not be too unseemly to consider it something of a stretch for the average purveyor of snare drums to branch out into the metallurgical world of cymbals and by comparison those who have made a decent impact on the humble casquette to build themselves a jersey. but then, if you've been around cycling caps for more than a year or two, your horizons might just start to encompass items other than headgear. and through immersion in peaked caps, your perspective on the ideal jersey might indeed be one worth hearing. such is the case for andrew and daphne at this is cambridge. granted they have strayed in the jersey direction on a previous occasion, but more by way of the graphic design dye sublimation thereof, having a third party sew the sleeves onto the torso. 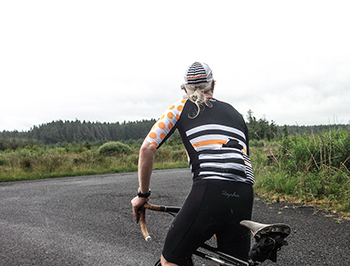 this time round, original is the name of the game and drawing upon their previous experience, their latest range of jerseys can be accompanied by the obligatory casquette and a pair of socks that complement both styles on offer. according to daphne "After several months of extensive work on pattern development, identifying the very best materials, product testing, and several rounds of refinements, we're proud to release a new range of high performance jerseys." but if you don't mind me mentioning, they would say that, wouldn't they. along with every other jersey designer and his dog that has released product onto a congested market recently. one need only repeat the quote from prendas' mick tarrant "Every man and his dog now thinks the pavé is made of gold!" in which case, have this is cambridge set themselves up for a fall by coveting that pavé? would they have been better sticking to what they know best? 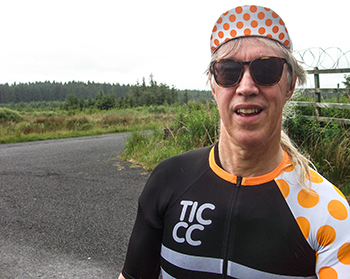 rather pleasantly for andrew, daphne and me, the tic hors categorie jersey is a remarkably good first solo effort. despite a need to hit the ground running these days, it's not often the case, a contention for which i have substantial evidence. i daresay they could have taken the easy route and produced a good, if unremarkable jersey, one that would have raised their profile, yet kept them just below the rarefied atmosphere as populated by the bigger and more established brands. instead, they've brought to market a very finely tailored jersey that takes account of contemporary thinking and fashion yet manages to occupy its own unique space. well, as unique as any jersey can be these days. you must learn that i am not just saying this because their small sized garment not only fitted this ageing frame, but managed to look rather flattering into the bargain. andrew did make mention that i probably wouldn't like the collar and in this respect he's bang on the money. in point of fact, there is no collar to like or dislike and for me that's a bigger deal than it might be for some. however, the length of those short sleeves brings them to an end in very close proximity to one's elbows and of that i heartily approve. additionally, the overall fit is very well considered on a fabric that would scarcely have the scales reach double figures. it's a bit of a cliché, but i do have thicker toilet paper (i checked). a clever, if hardly earth-shattering innovation is the inclusion of a fourth rear pocket, but rather than have it sit outboard behind a zip, this one is concealed within the rightmost rear, devoid of zip, but secure and weatherproof nonetheless. though a thin fabric will often display a greater propensity to stretch than one of heavier constitution, the size of the other three pockets is what one might describe as capacious. perhaps if i'd had more say in the size, i'd have opted for a medium; not because this didn't fit, but as one slightly long of torso a smidgeon more length wouldn't have gone amiss. in the throes of battle, however, the hors categorie jersey is precisely as described by daphne: high performance. i have no more scientific means of gauging breathability other than whether i'm still dry inside after lugging self and a steel chris king cielo up a less than amenable incline. another box ticked. 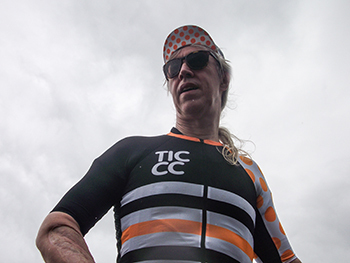 unlike many another cycle apparel provider, these jerseys are claimed to be unisex and sized from small to xxl at the performance price of £95 each. i'm still undecided as to whether i'm totally in favour of the orange polka dots on the left sleeve, combined with solid black and some white hoops, but that is surely a matter of subjectivity? i'd like to see what this looks like in simple, plain colours perhaps if and when they offer a winter-weight jersey with a collar. and they might think of making the front lettering (tic.cc) just a tad smaller. it seems almost unecessary to mention the matching cap, since this is a region of cycling apparel in which tic excel, a skill they have frequently demonstrated almost since day one. 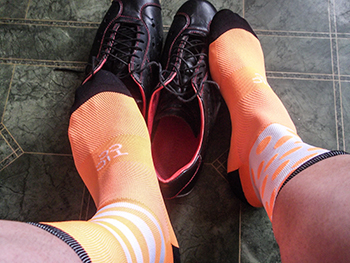 the cap retails at £24.50 while a pair of matching socks will add £13.50 to the total bill. 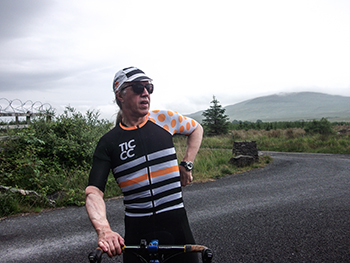 i'd be the very first to query why on earth we need yet one more cycle clothing provider on the list, but on the evidence of the tic hors categorie jersey, i might have to rest my indignation and despair for another day. one can only hope they're busying themselves designing a complementary pair of bibshorts.